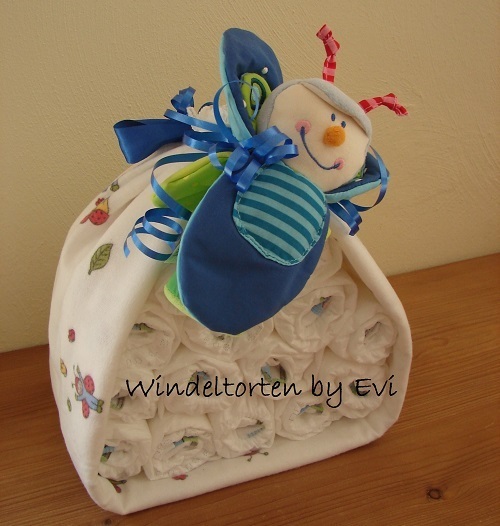 I have made the boy diaper cakes on this website (except the one at the top). If you have any questions, just ask. 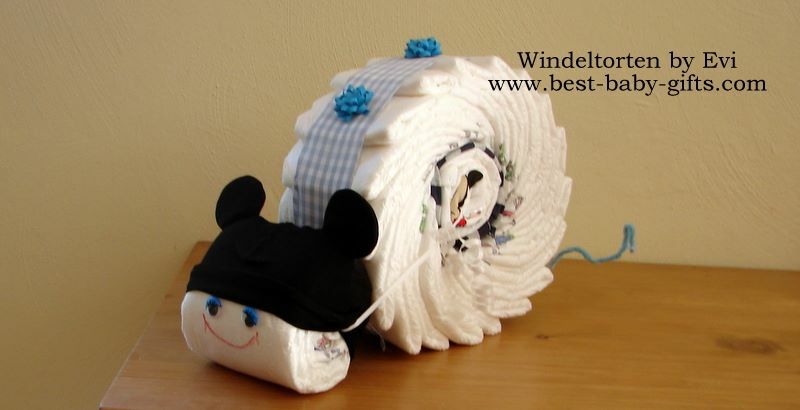 This page provides you with free instructions and lots of inspirational photos of unique diaper cakes with fun designs and fun colors for little boys. These diaper gift ideas are especially designed for male babies. 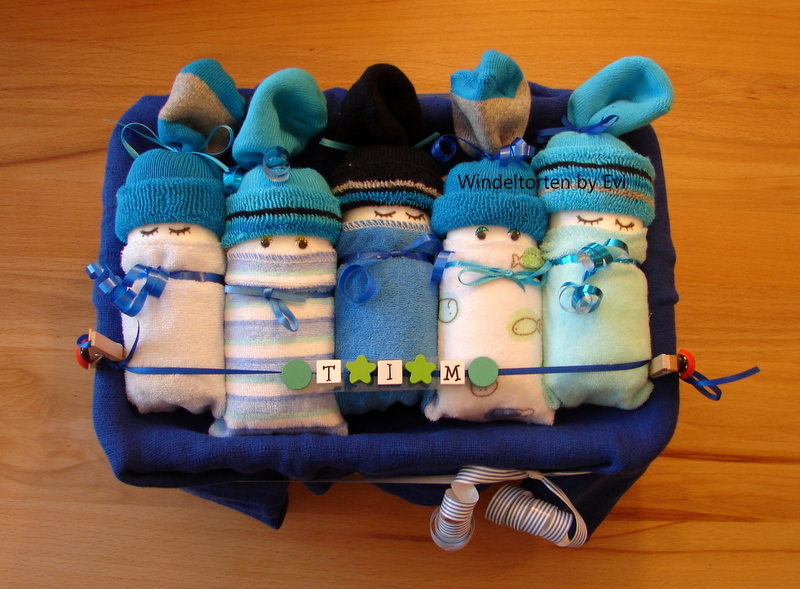 Mostly, they are crafted in blue or blue-ish colors, have blue accessories or a special boy theme. But green-ish colors, brown-ish colors and gray go very well with a boy diaper gift, too. 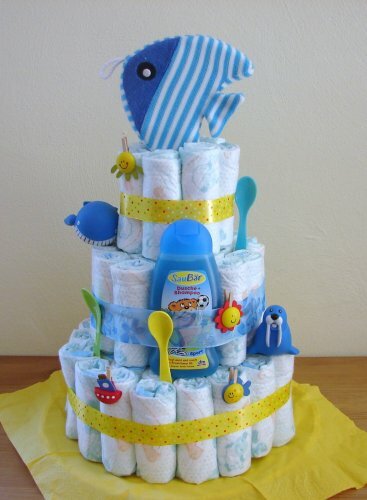 Making a DIY pampers cake is special and personal. And it is so easy that just everybody can do it. So here is how! 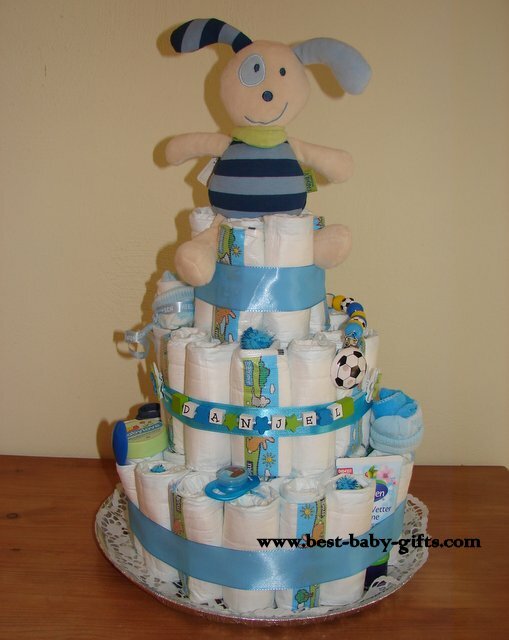 I have put together the Top 20 ideas for baby boy cakes made of diapers. Browse this page, choose your favorites or just get inspirations and then go ahead to make an awesome pampers cake yourself! 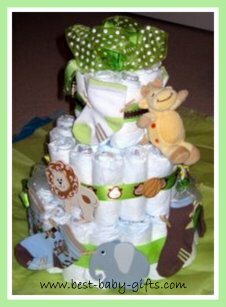 To see how to make a boy diaper cake 'basis', follow my free instructions for a 3-tier plain diaper cake. Leave away the cotton swabs and choose a blue ribbon or if you prefer, any other color going well with the rest of your items. Then decorate with the items of your choice as shown below. 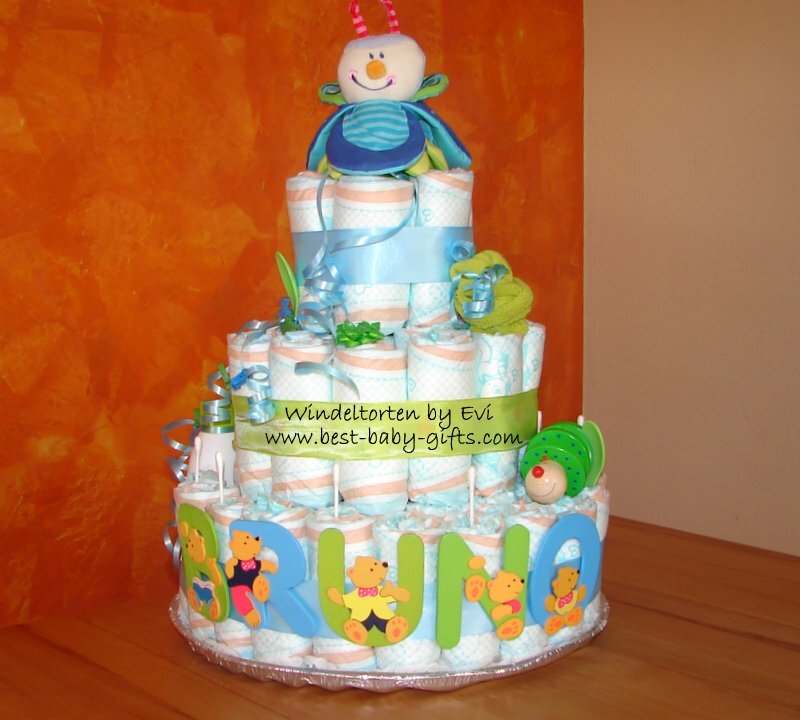 No time to make a diaper cake yourself? 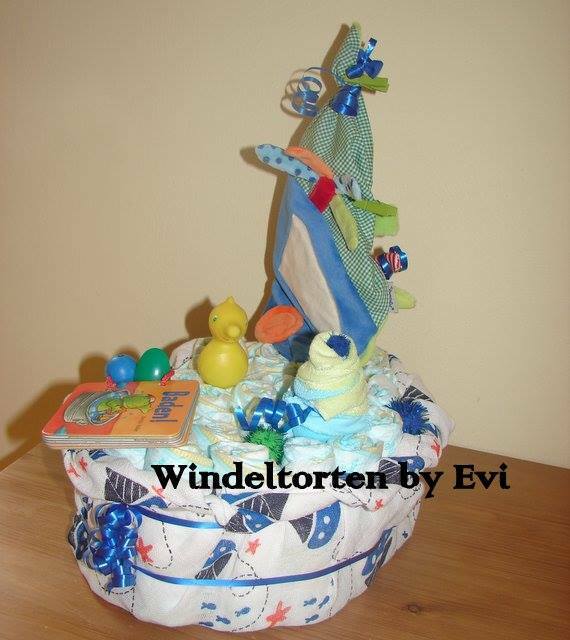 Boy diaper cakes for sale. - building vehicles diaper cake, etc. - Land Before Time, etc. Often party decoration from a Party Supplies Store will also do the trick, they have lots of goodies to pimp up your boy cake with. For example garlands, little flags, mini candles, stickers, etc. Baby shower party supplies also are a great source for your cake decoration. They carry lots of things with baby boy patterns and designs, such as 'It's a boy' banners and signs, crepe streamers (instead of ribbon), baby cut-outs, etc. Popular items to fix to diaper cakes are baby boy onesies, boy pacifiers, boy socks or booties, blue baby plush toys and so on. Browse here to see what to attach to your cake and how to best fix it - just always use the boy version respectively predominantly blue and 'boyish' colors such as green and brown for creating awesome boy diapercakes! For this pirate diaper cake I have used a small Playmobil set with pirates, a treasure chest, a monkey, a palm tree and a pirate flag. I have placed the pirates and pirate accessories around the cake. You can easily fix the Playmobil pirates by just hanging them somewhere on your ribbon. I have stuffed the top with a washcloth with a pirate design and have fixed a Playmobil palm tree there. This cake is also a personalized boy diaper cake. 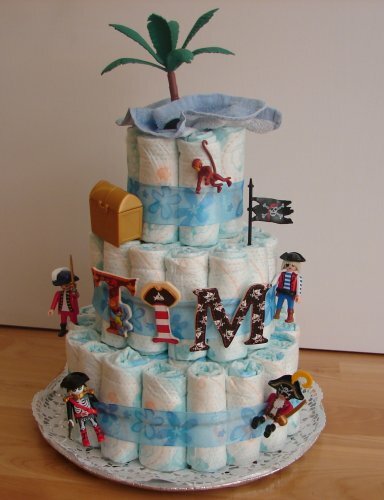 The letters have a pirate theme making them perfect for this great pirate diaper cake! For safety reasons, mommy needs to keep the Playmobil toys aside until baby boy is at least three years old! 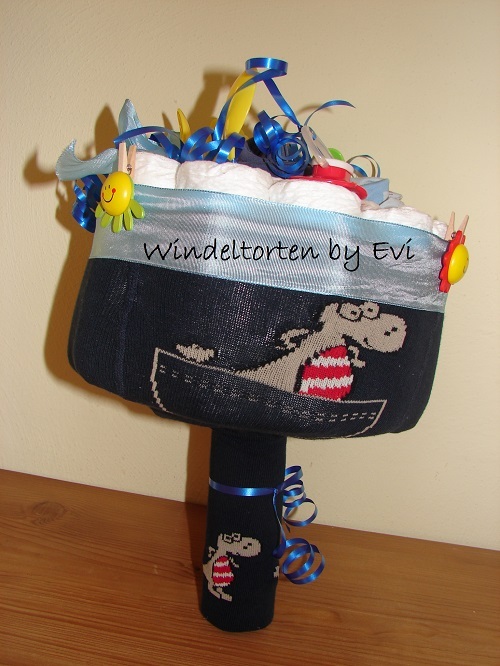 If you like pirate designs, also have a look at the pirate diaper bouquet below! This Cars Diaper Cake features a Disney Cars playset and some baby spoons. The little cars are lightweight and can easily be placed on top of the diapers. At the top I have fixed a gift certificate and a toy wind wheel. The base is covered with 2 Disney Cars napkins. A real eye-catcher for every car lover! Here, too, the toys must be kept away from baby until he is old enough to play with them! 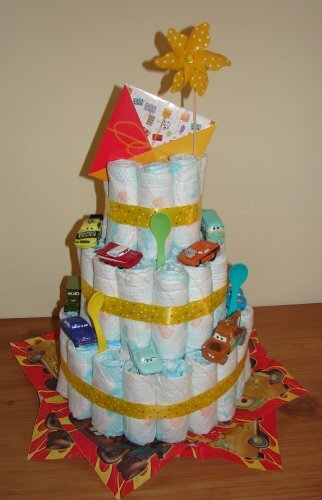 If you want to include Disney Cars baby merchandise into your boy diaper cake, consider the following items: Cars thermal bottle as your center piece, Cars flatware (available by First Years) to stick upside down into your diapers, Cars baby booties to stick between the diapers or to place on top, Cars toddler blanket to go around your cake or to stick into the middle (rolled up), Cars 'Baby on Board' sign to place on top, Cars onesies to roll up and stick between your diapers (remove a diaper from your cake and replace by the rolled up onesie), Cars baby bottles to replace a diaper, Cars stickers to decorate your cake, etc. Also check for Disney Cars party decoration such as flags, road signs, ribbons, and so on. This cute boy diaper cake features a cuddly dog sitting on top. 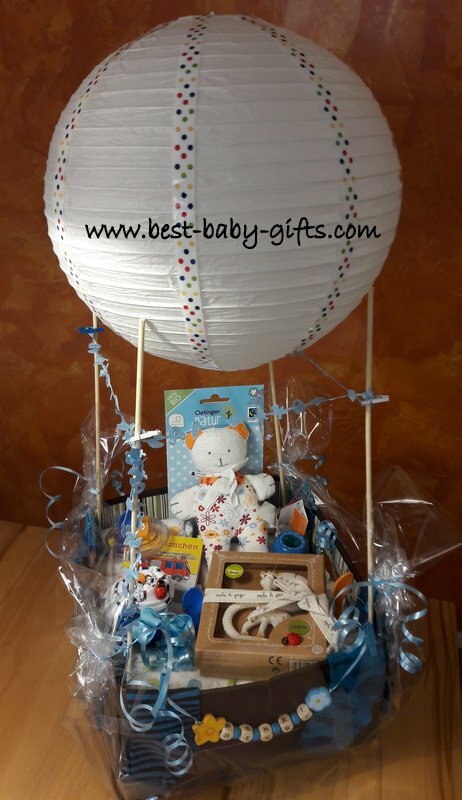 It's decorated with some baby care items such as baby oil and baby lotion as well as 2 pairs of baby socks rolled as flowers, a pacifier and a soccer themed pacifier chain. It's personalized for baby boy 'Danjel'. I have also used fuzzy turquoise pompoms in different sizes to top some of the diapers. While artificial flowers and roses are cute for a girl diaper cake, these pom-poms are ideal for a boy diaper cake. The giraffe diaper cake is quite similar, as a centerpiece on top I have used a giraffe baby rattle stick and have matched some of the accessories in yellow colors. 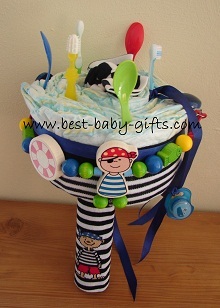 For this bathtime boy diaper cake for a little boy I have used blue squirting toys, some maritime cloth pegs, baby spoons, bottles of baby bath and baby shampoo (to fix them I have removed 2 diapers each and have placed the bottles inside the ribbon) and finally a fish sponge at the top. Splish splash, have fun, little baby boy -and your mom, too! With selecting the right colors and 'ingredients' you can create a perfect boy diaper cake out of a more girly theme. I have chosen the accessories and ribbons in green and different shades of blue and have added some pink post partum body care products for the new mom. I have replaced some diapers of the base with some little bottles and tubes for mommy. 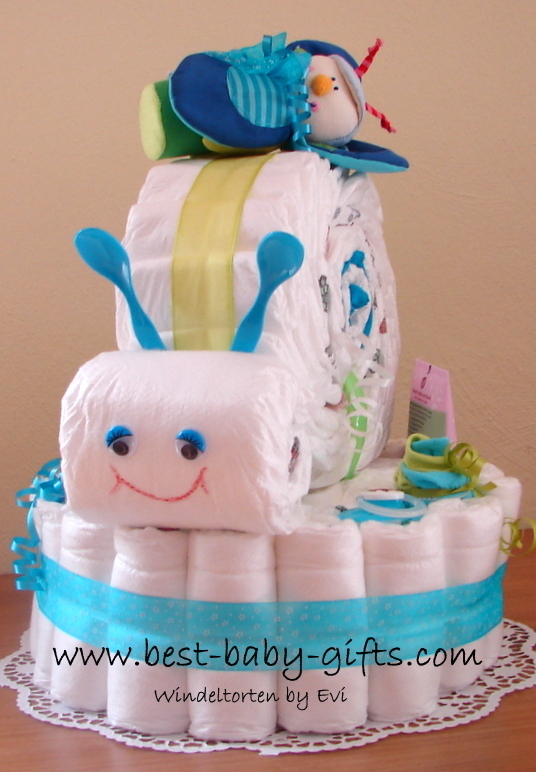 This cake is a mixture of a traditional diaper cake (first tier) with a diaper snail on top. 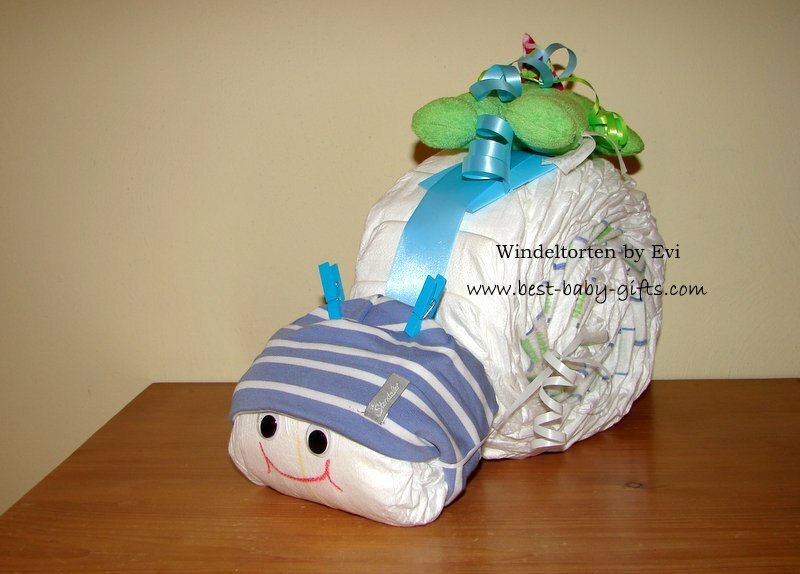 If you want to see how to make it, click on the diaper snail image further below. The snail is fixed on the base with 3 plastic baby spoons and it stays in place without any problems. 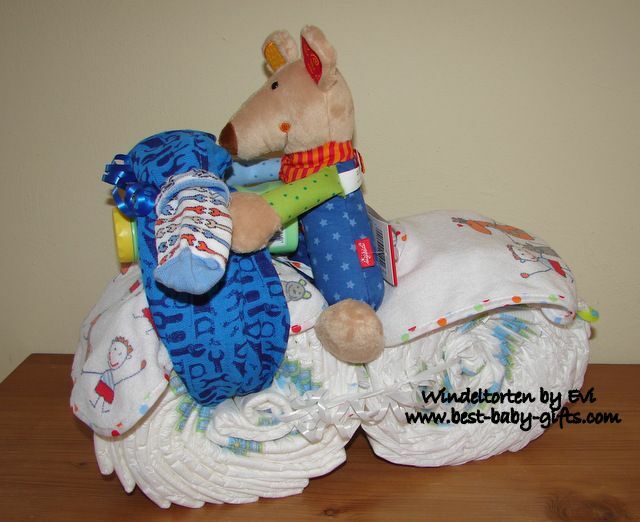 What to include in a Harley Davidson Diaper Cake. How to make a John Deere Diaper Cake for a baby boy. 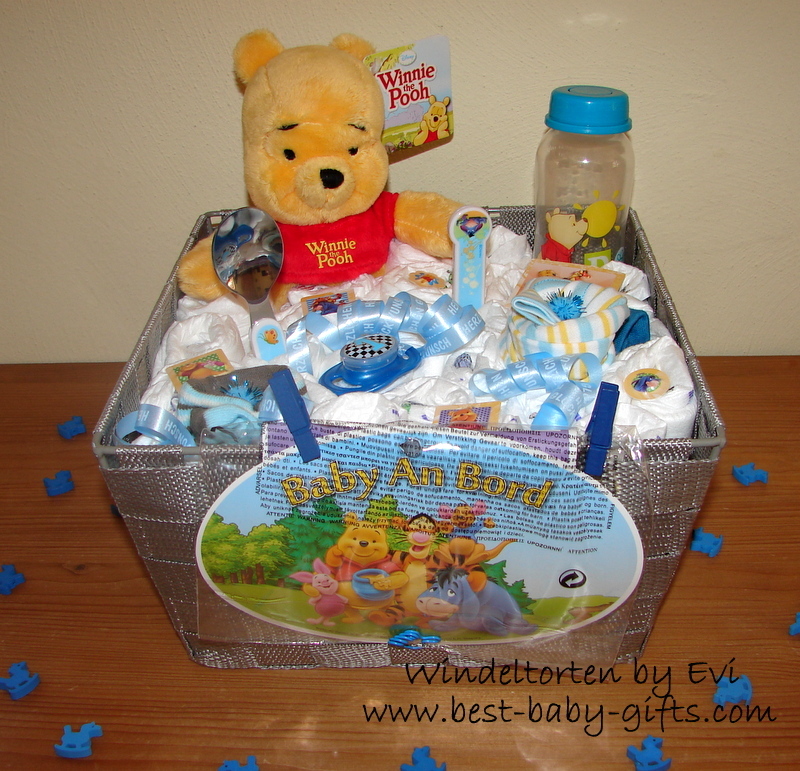 Nowadays, diaper cakes are very popular and present at nearly every baby shower party - but these Boy diaper gift variations are still is something unique and special. These bouquets, a pirate diaper bouquet and a dino diaper bouquet, contain lots of baby goodies. They are easy to make and really make an impression! Learn here how to make these stunning diaper bouquets! Aren't they cute? 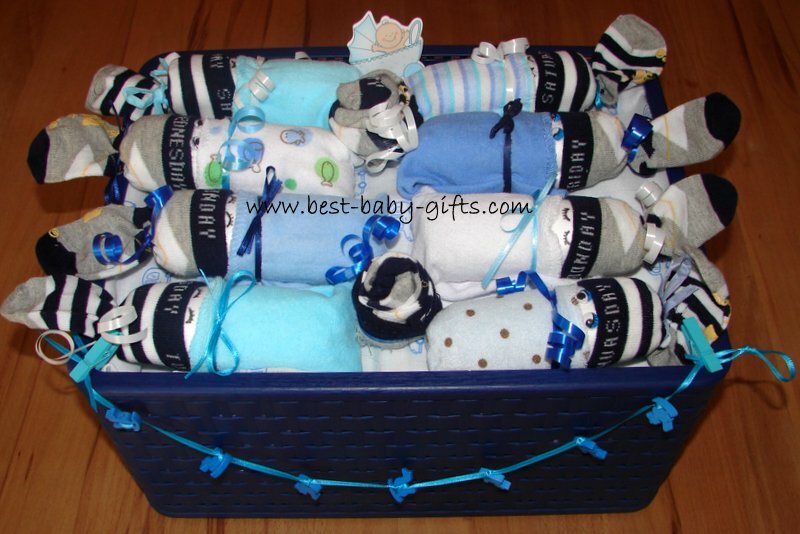 All you need for this boy diaper gift are diapers, socks, washcloths, a baby storage box, a burp cloth, wobbly eyes and some decorative ribbon - preferably everything in 'boy colors'. You can also personalize this gift. See another idea how to arrange these babies in the photo below. For instructions click the image above. These are so cute, too. Just get some blue accessories and these diaper animals make a perfect diaper gift for a baby boy! 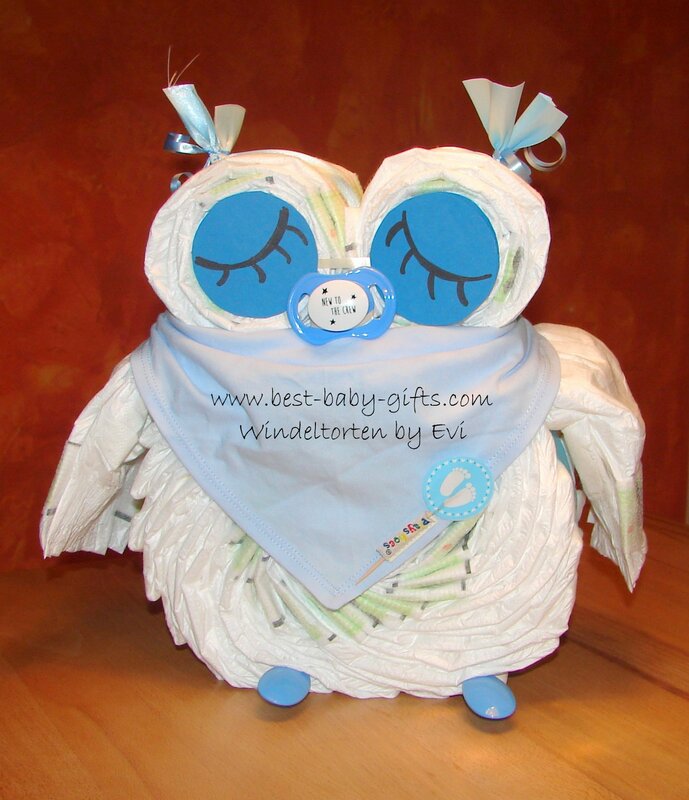 Even though an owl and a snail are not a typical boy theme, these work out just fine for male babies if made in blue, green, brown or even grey. How to make them? Just click on the photos to get directions. Hot air balloon diaper cake instructions. It's a girl!? Girl Diaper Cakes. More unique baby boy gifts.